[by Kim Min Soo] The steamer like heat has passed and a fresh breeze blows in the morning and night. Stars are gaining attention as they have styled with the fall atmosphere as the season approaches. 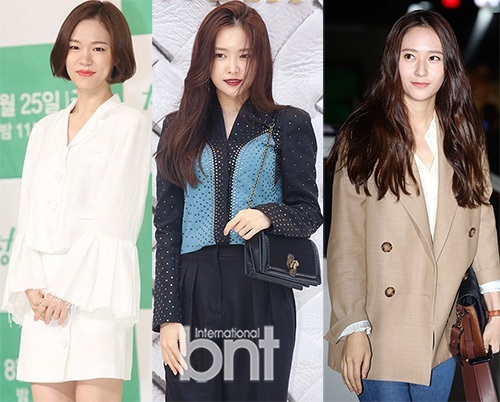 Recently actress Han Yeri and A-Pink member Son Naeun and actress/singer Krystal appeared in fall fashion items, melting many men’s hearts. We investigated their fall styling methods that presented a chic yet elegant charm. Actress Han Yeri who has charming single eyelids appeared on the stage of the press conference of JTBC drama ‘Age of Youth Season 2’ in an elegant fall look. The sleeves had ruffles and the blouse matched with the mini skirt, and she even exposed a little bit of her collarbone, presenting an exciting yet feminine mood. [Editor Pick] The all-white look that was popular in spring and summer is rising again as a trend this season and is expected to be popular with women. Especially because it can complete your fashion femininely with a refined touch, in a formal situation, it is no different when it comes to an office look. A-Pink Son Naeun was the center of attention at an official brand event as she showed a chic and beautiful image compared to her normal natural fashion. She left a deep impression with her red lips and matched her special designed blouse and black pants to present a fall feeling. Although she didn’t use any special items her stylishness is amazing as expected. [Editor Pick] The keyword for the upcoming fall is definitely black trend. Appearing a bit haughty can completely coordinating a bit more edgy. You can especially increase the mature feeling of black’s simplicity. Krystal who gained attention playing the role of Moora in the recently ended drama, ‘Habaek’s Bride’. 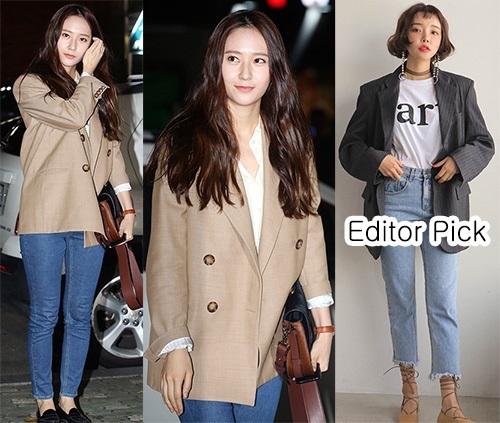 Krystal appeared at the drama after-show party in an over-sized jacket fashionably without any special accessories. As usual, the jacket will be a trend in this upcoming season as well. Next articleEscape from Greasy Hair! What is the Solution to Oily Scalp Care?